MINILEC offers its unique alarm Annunciator based on the latest single chip micro-controller technology with serial communication facility. Available in 19” rack type enclosure. 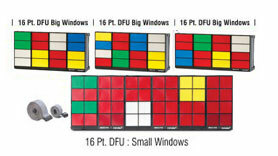 MBAS 9700 annunciators have split architecture for 24, 32, 48, 64, 80, 96,112 & 128 windows. 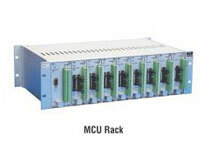 24, 32, 48, 64, 80, 96,112, & 128 window models are housed in 19” rack type enclosures, separate for MCU and for PSU. Here choice of facia (DFU) is of 3 types (a) Small size i.e. 30 x 30 mm and (b) Big size is 30 x 65 mm (c) 50 x 70 mm. 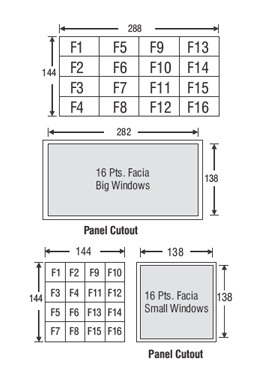 Facia is available in multiples of 16 windows. In addition to all other standard features, MBAS 9700 has additional facility of computer linking. A serial port (RS232/RS485) output is available which can be supported by an IBM compatible PC of minimum 386 configurations. 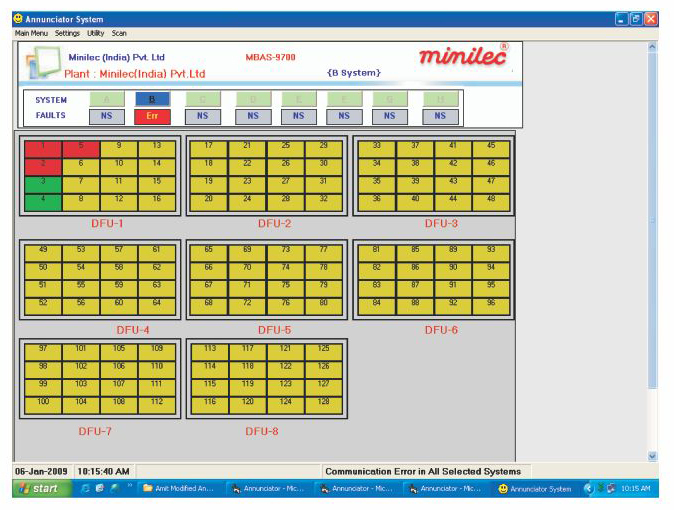 Minilec can supply the standard software with every model or can develop suitable software as per customer requirements or can provide source coding / protocol details to enable client to develop their own suitable software. CPU module is the Main Processing Unit of MBAS 9700 which scans and processes the incoming fault signals from the various potential free field contacts through IOU module, and drives the corresponding LED windows and the audible device in order to annunciate the fault through IOU module. The IOU module is the input & output interfacing unit. To each IOU module 16 input contacts (potential free) & 16 window LED's can be connected. 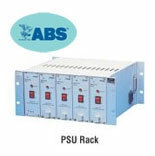 PSU converts the available power source into a regulated and filtered DC output, which is fed to the MCU Module & DFUs. The power supply can accept Specified AC or DC I/P supply, depending upon the application. Redundant Power supply is available. The MCU unit transmits fault information to computer serially. RS232/RS485 standard is used for serial communication. Communication protocol modbus ASCII / RTU can be offered. In computer user-friendly software is written. This software offers online Date & Time setting, Legend setting, Display window & also it gives fault report with on demand printing facility. 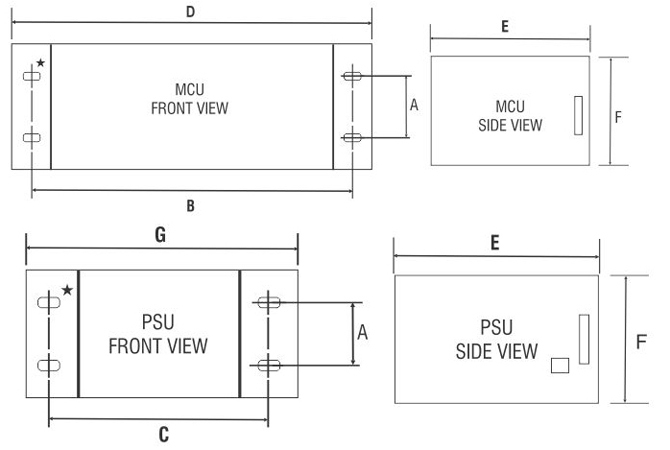 Dimensional Details - MCU & PSU: MCU & PSU for 24 to 64 windows are housed in one 19” rack. 128 POINT 144m.m. 2304m.m. 70m.m. 112 POINT 144m.m. 2016m.m. 70m.m. 96 POINT 144m.m. 1728m.m. 70m.m. 80 POINT 144m.m. 1440m.m. 70m.m. 64 POINT 144m.m. 1152m.m. 70m.m. 48 POINT 144m.m. 864m.m. 70m.m. 32 POINT 144m.m. 576m.m. 70m.m. 24 POINT 144m.m. 432m.m. 70m.m. 128 POINT 144m.m. 1152m.m. 70m.m. 112 POINT 144m.m. 1008m.m. 70m.m. 96 POINT 144m.m. 864m.m. 70m.m. 80 POINT 144m.m. 720m.m. 70m.m. 64 POINT 144m.m. 576m.m. 70m.m. 48 POINT 144m.m. 432m.m. 70m.m. 32 POINT 144m.m. 288m.m. 70m.m. 24 POINT 144m.m. 216m.m. 70m.m.